Author: Karmel, Alex Set In . . . Description: or anyone who loves Paris and the mysterious allure of old houses, this charming, personal and informed memoir makes for perfect reading. In a knowledgeable, literate style that conveys (and makes contagious) Karmel's love of his subject, A Corner in the Marais traces the architectural and social development of the City of Lights, from its origins as a Roman settlement, through major redevelopments brought about by Henry IV and Baron Haussmann, through the recent, and sensitive, renovation and restoration of its old neighborhoods. The story begins with Karmel and his French wife fulfilling a long-standing dream: buying an apartment in the Marais, Paris's celebrated historic district, the site of some of city's oldest and most picturesque buildings. It soon becomes clear that their new home, which has witnessed six centuries of Parisian life, provides not only a refuge but a fresh and lively vantage point from which to view the city's history, revealing information that will surprise even the most confirmed Francophile. The book concludes with a "walking tour" of Marais, in which the principal buildings are discussed with brisk authority. Although Karmel takes pains to fill in historical lacunae from town records, he never loses sight of the fascinating human details whether royal squabbles, commercial transactions, or family chicanery that have played their role in shaping Paris as we now know it. 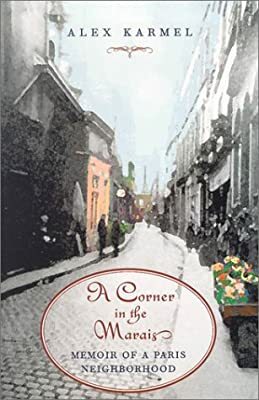 Illustrated with photographs and period engravings, A Corner in the Marais is ideal reading for anyone who loves exploring the hidden byways of vieux Paris and experiencing history from a personal and singularly engaging viewpoint. "Karmel illuminates shadows of French history, architecture, even character and theater with a novelist's knack for detail and an architect's eye for stories in stone."